***To order – click here! Love butterflies? We’ve got a colorful butterfly puppet craft you can do at home…also great for school and story time fun! For directions, click here! Worried about our Honey Bees dying off? Here’s a simple GREEN GREEN way your family can help…and save money too! : Click here for a Bee-Friendly weed formula. School visit info – click here! Reviews, Honors, Press – click here! Upcoming appearances – click here! Soon we’ll be featuring here community gardening-related info, and more activities and crafts that kids will really “dig.” Plus more ways families can help our world stay GREEN GREEN, so check back often! What happens when you dig the ground and plant seeds? A garden grows! What happens when you dig the ground and set in steel beams and concrete? A city grows and grows. And what will happen to that abandoned lot squeezed between two buildings? GREEN GREEN celebrates the spirit and adventure of making something grow, and Grow and GROW. Gardens can sprout up anywhere – and lots of community gardens are popping up all over cities. See what a little digging can do! 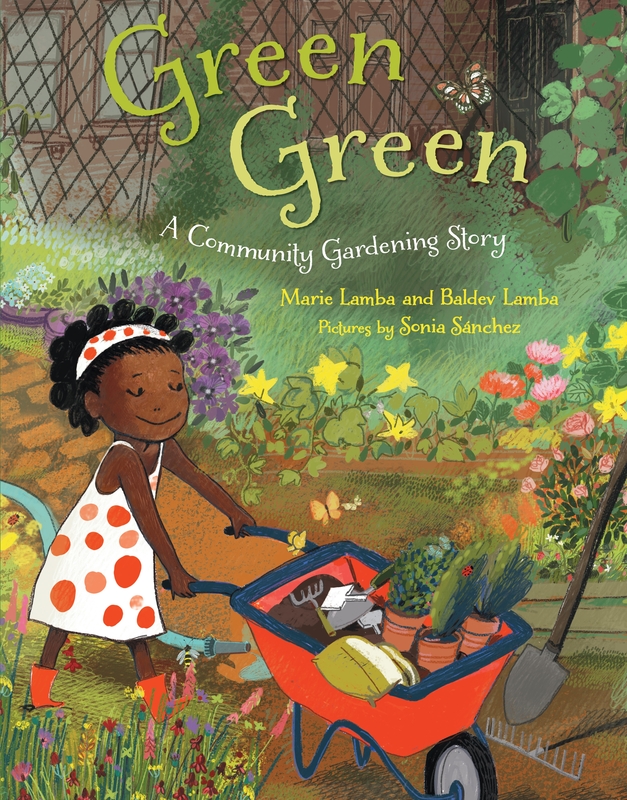 This book includes ways kids can be more GREEN GREEN, including how to help save threatened honeybees and Monarch butterflies. Authors Marie and Baldev Lamba are a husband and wife team, and this is their debut picture book! They live in Pennsylvania, where they try to make all sorts of things grow in their yard. Marie is the author of several young adult novels, and an associate agent at Jennifer De Chiara Literary Agency. Baldev is a landscape architect and owner of the award-winning landscape architecture firm Lamba Associates, Inc. He is also chair of the Department of Landscape Architecture and Horticulture at Temple University. Award-winning illustrator Sonia Sanchez was nominated for the prestigious Eisner Award, and her debut picture book HERE I AM, written by Patti Kim (Capstone / Picture Window Books), received starred reviews from Kirkus, Publisher’s Weekly and a rave review from The New York Times. Sonia lives with her husband and a sleepyhead cat in a blue house near the Mediterranean Sea. First let me tell you I loved GREEN GREEN! If I or my children were still young we would probably get a copy and read it over and over and share it as well! By way of my local public library, I ordered a copy to read, thinking there would be reference or information on ‘community gardening’. Unfortunately, there was not. HINT HINT! Looking forward to reading your other and future works.